Money, money, money…makes the world go round! What is money? When did it start? Does everyone have it? Money exists today in most countries that have moved from the barter system, or exchange of goods for other goods or services, to the use of units such as coins and paper bills. Money involves units that have been ‘given’ value. That value is always changing due to the exchange in the market. We call this exchange supply and demand. If the supply is greater than the need, or demand, things will most often be cheaper. If there is less supply and not enough to go around, things will most likely be more expensive. Today in addition to market value, pressures of supply and demand, there are other very serious global implications that impact the value of money. Watch the Value of the Dollar Bill TEDed to learn more. There are many things you can do with your money. You can invest, save, donate, and spend. Each of these things will either add or take money out of your pocket. Choose the right one and you will have money when you need it. You can also become a Numismaticion and study, like the Roman Emperor Julius Caesar did, the history of money. Coins, after centuries of bartering cattle, wheat, other food goods, stones and even fish were the earliest form of money. They contain ancient history. On the face of coins there are often the images of rulers, symbols of families, names of countries, date of making. 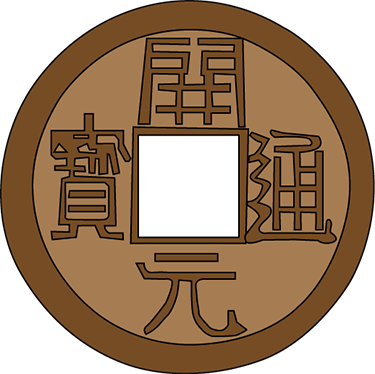 “Cash” is a word ‘coined’ from the Tang Dynasty’s “kai-yuan” or square holed round bronze coin. Coin collecting, known since the Renaissance, as the ‘King of Hobbies’, is one of the oldest pastimes. Coins are collected for their value as long as they have been used as a form of credit. Coins are also collected for their artistic and cultural value. Today people enjoy collecting coins for pleasure, for the value of the metal, for investment. The study of coins or coin-like objects is known as used as Exonumia. Research names and designs of early coins. Make a coin timeline drawing of at least ten ancient coins from different historical periods and from different continents. Did you ever find a ‘lucky penny?’ Finding a coin has been a sign of good luck for centuries. In the United States the penny is the smallest amount, one cent, that can be found. What is on a penny? Who is on the front? Look closely at pennies and you will see a year and a place printed on them. Draw the front and back of a penny with all of its details. Next collect enough pennies to equal dollar. Find a nickel. Who is on the front of the nickel? Draw the nickel at a large scale but in proportion to your drawing of the penny. Now collect enough nickels to equal a dollar. How many will you need? Dimes equal ten pennies. Who is on the dime? Add your drawing of the dime to your earlier drawing of the penny and nickel. Collect enough dimes (ten) to equal a dollar. Finally, find and draw a quarter. Four quarters equal one dollar and provide a small stack of coins compared to pennies, nickels and dimes. But more interesting, quarters have images that feature a state on one side. Can you collect all 52 of them? After your drawing of the front and backs of these four coins is complete, play the America is Beautiful Quarter Game. Play the money counting game. You are in the money now! Think about starting a penny drive at your school. Add nickels, dimes and quarters if you’d like and start a ‘loose change’ drive! Who needs money more than you? What is a worthy cause? Will you donate the money to people or organizations in your own community? Will you look into regional and national organizations? Will you send your aid abroad? Pick a place to donate the money you are going to raise. Then go to your school or local activity center and promote your loose change drive. Maybe you could have a carnival or a talent show. Raise the money. Count it. Donate it! Where are coins made today? Coins today are no longer pounded by hand or forged in ovens. They are made in buildings, called mints, in different countries. In the United States, coins were minted started in 1792 in a building, called a “mint” in Philadelphia. Currently there are four mints producing coins (and bills) in the United States. They are located in Philadelphia, San Francisco, West Point (NY) and Denver. Take this virtual tour of the United States Mint to see how coins are produced. The process involves drawing, modeling, digital adjusting, sculpting, digital milling, and creation of a master ‘hub’ and master 'die’. After you complete your virtual tour, take a closer look at the six step process of making coins. Starting with blanking or cutting of blank disks, the disks are then heated in an 'annealing furnace’, washed and dried.The blanks are then scored and raised around their edges to help protect the shape. Next, the blank disks are stamped with the designed inscription that makes them legal United States Coins. The coins are then hand inspected, counted, bagged and delivered to banks throughout the country. Make a poster of the minting process with the six steps described and illustrated. As carrying large amounts of coins proved to be very heavy and cumbersome, people devised other ways of noting exchanges. The Chinese used leather imprinted receipts to denote exchange of goods as early as the first century and then moved to paper bills in the Song Dynasty producing the world’s first government issued paper money system several hundred years before it became commonplace in Europe. It was Marco Polo who described the Chinese use of paper to the Europeans. In 1862 the first dollar bill entered circulation as a Legal Tender Note. The dollar bill we know today was created in 1929. Even though it is commonly called ‘paper money’, today’s dollar bill is actually made of fabric, a blend of linen, cotton and silk fibers. Find a dollar bill. Draw all the elements of the front side on a piece of paper. Take care to draw everything, even the details, as accurately as possible. This will take some time. Research what each symbol, image, notation means. Add notes to your drawing to reveal how much work goes into designing a dollar bill. What other amounts of dollar bills does the United States make? Research the history of the EURO. Make a map of Europe and draw in or along each country the bills and coins of the currencies used in the EU before the EURO was introduced. Write a short story of why the EURO was conceived and how it has faired since its inception. Money in other countries goes by other names. Make a chart of money names for at least 10 countries. Using the Internet, capture pictures of foreign currency and place them on a black line drawing of a world map. Compare the American dollar to other currencies like the yen or the lira or the peso! Add a chart of how the dollar stands in comparison to the value of at least ten other countries. Show the countries unit of money, symbol, value in comparison to the dollar and a picture of the money. Present your findings to your class! 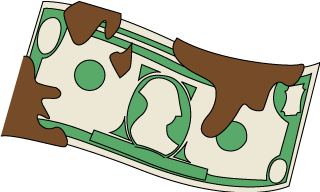 Did you know that the money in your pocket is dirty? Money travels many miles, through many hands, for many weeks, months and even years, before it is melted down, reprocessed and remade. For instance, how long does a penny last? How about a dollar bill? Research the health of your money and start thinking about washing your hands after you pay or accept payment! Today many people have plastic, wallet size debit and/or credit cards they use to pay for items. The debit card requires establishing a bank account with money deposited in it. 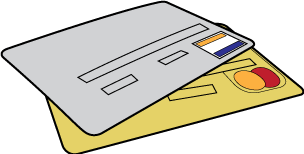 Debit cards also require a pin number, known only to the holder and the bank. When used it takes money directly or takes out money directly (and digitally) from the banker to pay the merchant. Credit cards work differently in that they delay collection of payment for one or more months. If payment is not made in full at the time of the delayed billing, your payment increases to include interest. All credit cards carry an interest penalty for delayed payment so it is the best policy to only purchase what you can afford to pay for if at all possible. Debt free living is freeing. What system was first used for an honest exchange of goods? Which culture used paper banknotes first? When did the United States print the first US Dollar? Where is the best place to save money? what can one do with money? How Money is currency is in circulation in US? TIME is Money TEDed: How to calculate the value of your money?